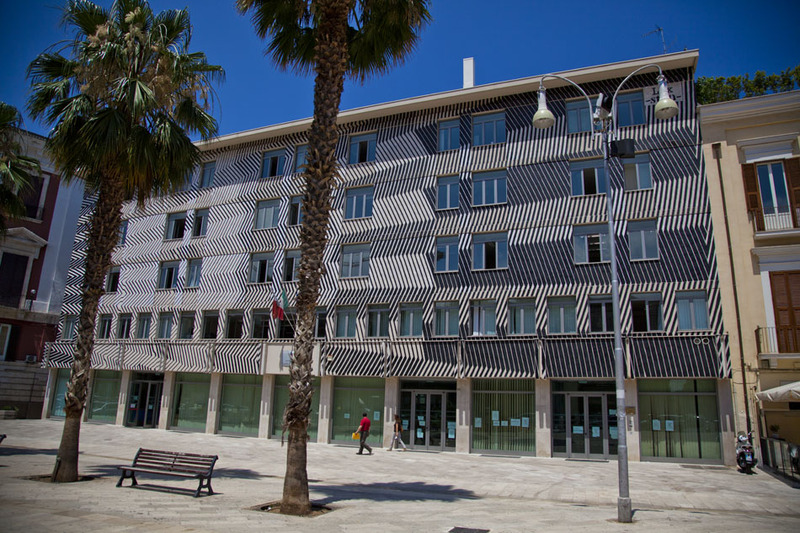 This building is situated in Bari in Corso Vittorio Emanuele. We did an abstract stencil using the technique of Stencil Poster. We pasted up a poster with the image printed on it. We cut every lines on it then after coloring with black the stencil we pulled off the paper, destroying the stencil itself. On 25 June 2013, at 7.00 p.m. theart galleryof Bari Doppelgaenger presents the Fresh flâneurs retrospective dedicated to the recent street art’s evolution with 108, El Tono, Hell’O’Monster, Ozmo, SAM III and Sten &Lex; the six invited artists compared oneself both to the gallery’s spaces and some places of the city. The result of this work is not only a traditional exhibition, but also a dense program of mini-residencies produced by the gallery between May and June. Within this scenario, Doppelgaenger has chosen to combine the exhibition in gallery with a project of urban art togheter with the support of the Commune of Bari inviting national and international artists in order to redevelop with their own works certain areas of the city which, at the moment, are in a state of degradation. This appointment is a first passage that, over the time will allow Bari to be proud of an open pit mural works’ park having an assured social and touristic impact. One of the most representative trait of fresh Flaneurs is the variety of its artistic offering: directed by Vittorio Parisi- art critic and gallery editor, as well as, town counsellor for urban art of Bari – the exhibition’s aim is to bear in Bari an important and heterogeneous witness of the styles, techniques and genres that have characterised the urban art of the last decade. The retrospective will see operate in some specific areas of the city the Italian artists Sten & Lex (stenlex.net/), Ozmo (ozmo.it/) and 108 (108nero.com/), the Spanish SAM III (sam3.es/), the French El Tono (eltono.com/), the Belgian trio Hell’O’Monsters (thehellomonsters.com/). This entry was posted on 17 July 2013 by osteno. It was filed under EN PLEIN AIR .